WHAT IS IT? The Model HB is a set of 12 replacement bristle strips used to rebuild a Model HS brush assembly or to rebuild the existing brush on a Model BR motorized brush style conveyor belt cleaner. WHY IS IT NECESSARY? The Model HB allows the user to rebuild a brush assembly in the field when the bristle strips have become worn or damaged due to wear. Note: Bristle diameter 0.040 is standard for nylon and polypropylene, while 0.028 and 0.014 are special. Pricing upon request. A typical part number would be "HB(bristle diameter)(bristle material type)(belt width/brush width)" such as HB040N24 or HB040N30 or HB040N36, etc. Bristle diameter 0.040 is standard, while 0.028 and 0.014 are special. Bristle material is "N" for nylon or "P" for polypropylene or "W" for oil tempered wire (special order). 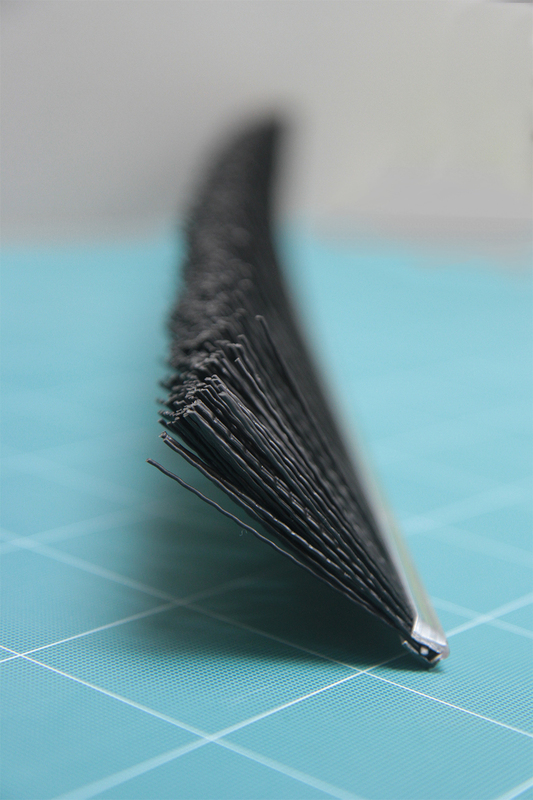 The bristle strip length is equal to the brush width or conveyor belt width.